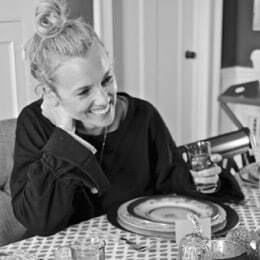 You know that feeling when you have the answer and your hand is up and you’re waving it back and forth (and then the teacher calls on someone else who has their hand raised quietly)? Well consider this post my hand waving around in the air with excitement. Backing up, I had this idea… said every blogger ever. After the high of my concrete planters wore off, I still had a little concreting left in my system. I am also desperate for a water feature in our yard that doesn’t involve watching Hurricane Sandy creep up from the wetlands and into our basement. Here’s my concrete meets water feature masterpiece (if I do say so myself). 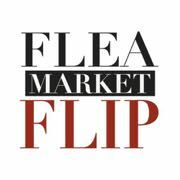 I’ve included affiliate links for your convenience. The plan in my head was for an orb to be resting on a bowl that would catch/ circulate the water. I started by making the base. With my jigsaw, I cut both cardboard tubes: the outside tube was approx. 6″ and the inside tube was a little longer at 10″ maybe? With duct tape, I sealed off the bottom of the smaller tube. I drilled/ jigged a hole in the middle of a board just big enough to fit my PVC pipe. 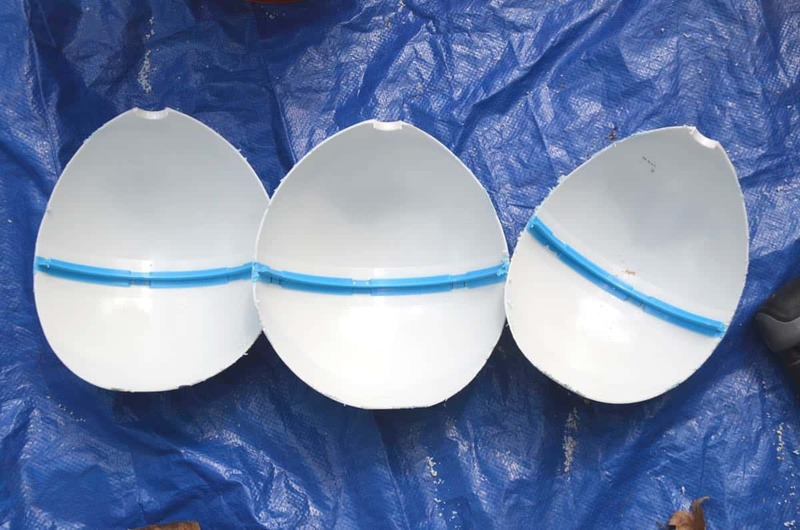 You’ll need to work backwards to determine what size pipe to get…. once you buy the fountain pump, you’ll need tubing that will fit and THEN you can buy PVC pipe that’s just wide enough to fit the tubing. Make sense? (If you buy the fountain kit I got, then 1/4″ inner-diameter vinyl tubing and 1/2″ PVC pipe will work.) I used a little bit of duct tape to hold the pvc pipe in place and then centered the widest ring mold. I sprayed the inside of the ring with cooking spray because why not. Then I mixed my concrete and plopped about an inch into the outer mold. 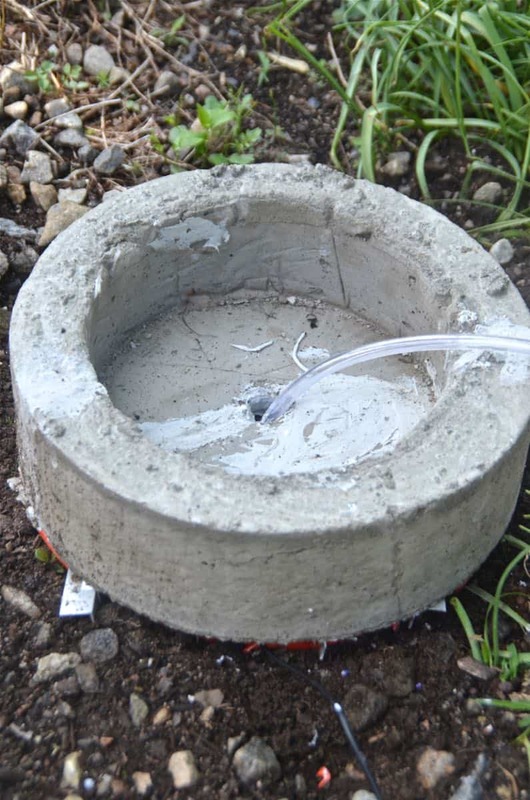 Then I slid the inner ring over the PVC pipe (I cut a few slits in the duct tape across the bottom so the pipe would go through) and filled in around this with more concrete. Hopefully the pictures will make more sense. This was where I had to problem solve on the fly a bit. 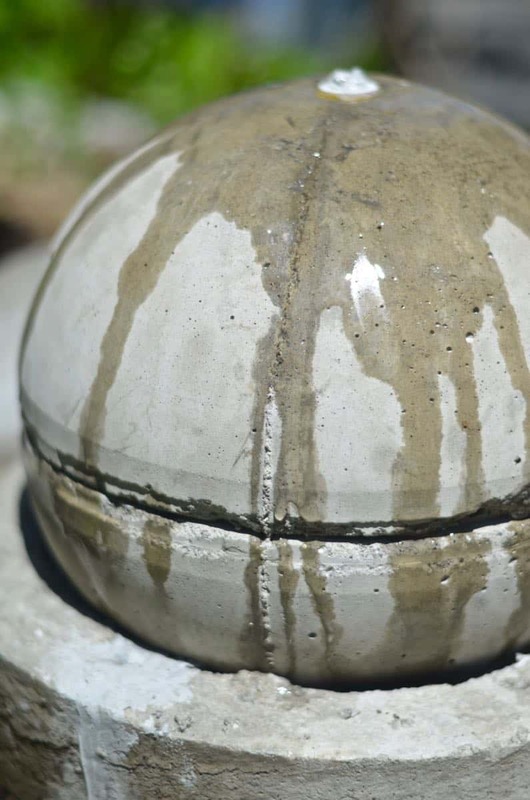 Unlike the orbs I made before, this globe wasn’t glass so it wouldn’t easily break away to release the hardened concrete…. so I decided to cut it into quadrants and used duct tape to stick them all back together. 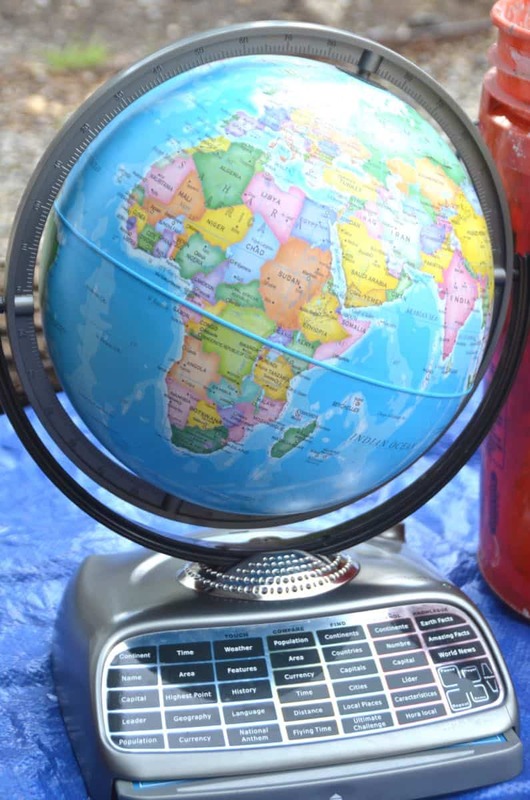 I also learned that unfortunately the equator on this globe was actually a thin plastic ring that projected inside the globe 1/2″ so my orb wouldn’t be a smooth circle. Erm, I’ll call it character. 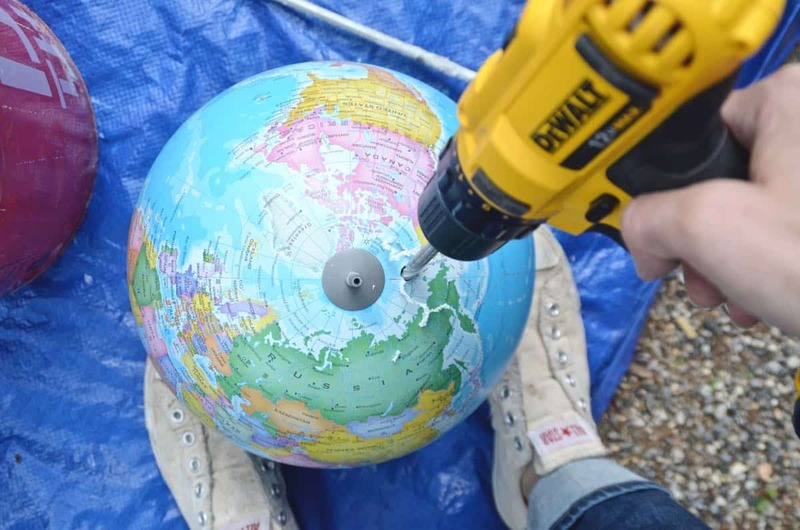 I filled the globe with concrete being careful to tap every so often so that there wouldn’t be air bubbles. Once it was pretty much full (i.e. 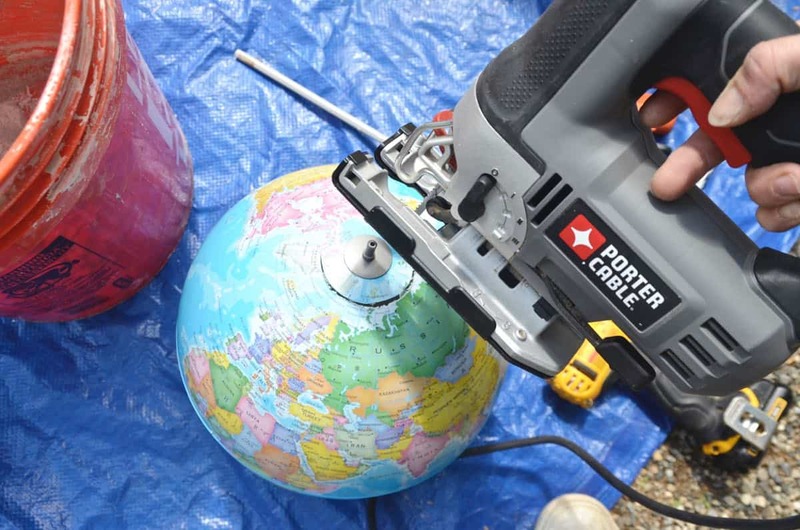 heavy as sin) I took my length of PVC pipe- with duct tape over the end- and inserted it straight down into the globe until it was touching the bottom. I let this cure in a flower pot so that it wouldn’t roll around. While this and the globe were drying, I started plotting the fountain logistics. 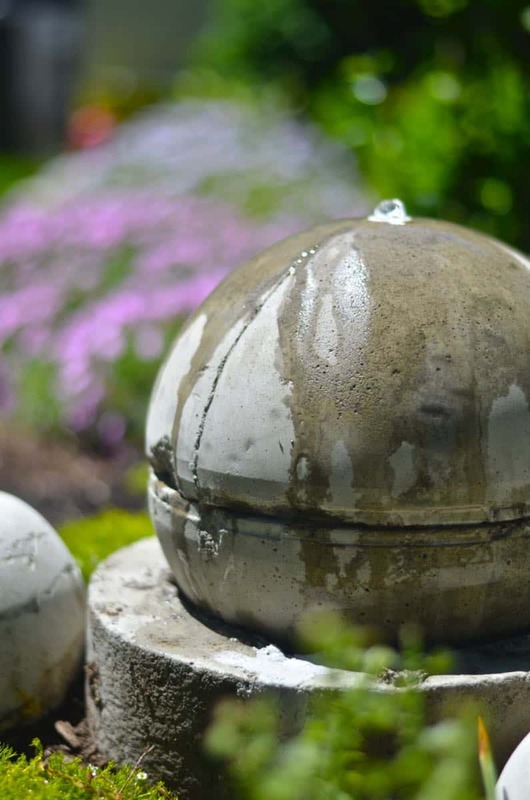 Originally I was thinking that the concrete basin would hold enough water for the fountain, but then I needed a way to hide the pump inside the orb and bla bla bla… it wouldn’t have worked. So I grabbed my trusty $5 Home Depot bucket and dug a hole big enough for this to fit cleanly (remove the handle). I decided on a solar fountain pump because we don’t have any outlets behind our house and the idea of an extension cord running along the patio wasn’t what I was going for. 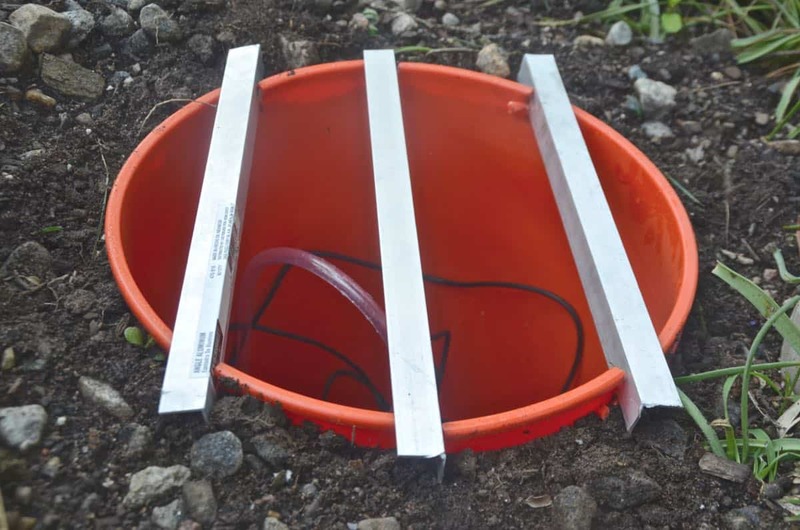 This solar pump works GREAT when it’s in full sun. But it’s super sensitive so even the slightest shadow will shut it down. There are solar pumps available that will also charge a battery so the pump will work even when it’s not sunny, but that was more than I wanted to spend before I knew this fountain plan would actually work. 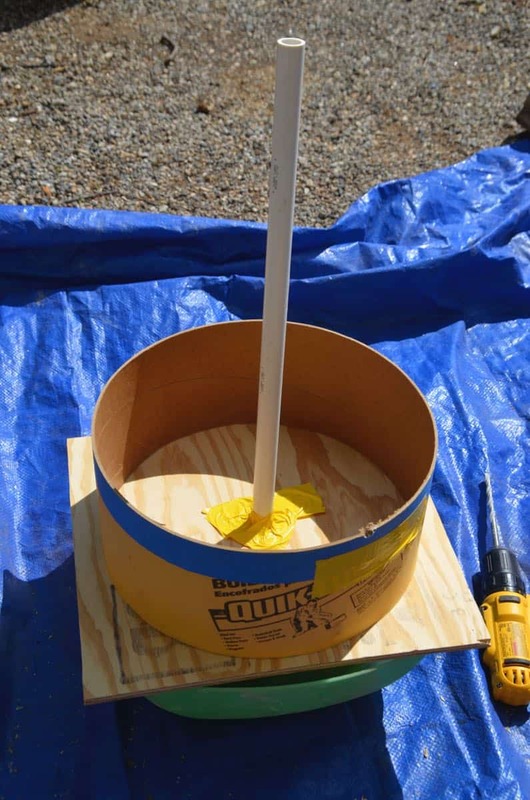 To keep the pump from getting clogged with dirt and debris, I rigged a little platform for it inside the bucket with epoxy and an old inverted tupperware. No magic to this so anyway you want to raise your pump off the bottom is totally fine. 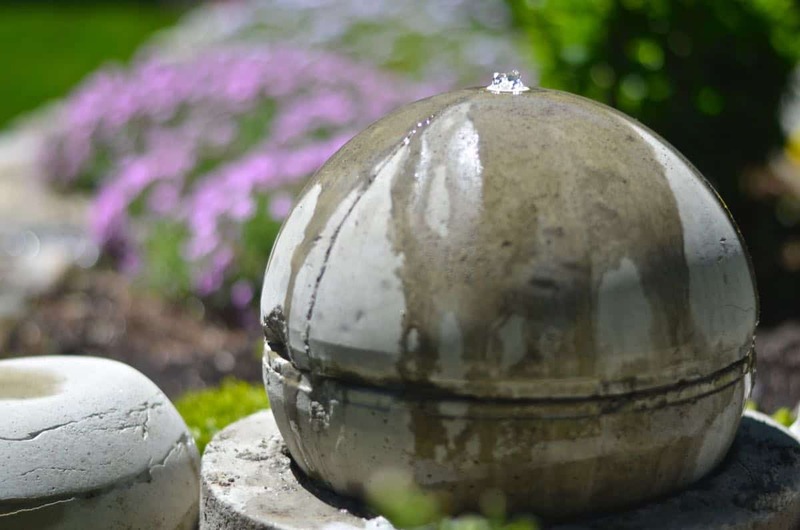 Fill your bucket with water before fitting together the fountain as it will just be easier. My concrete base was about the same size as the bucket, but given the whole cracked in half situation, I used these leftover L-bars to add some supports. 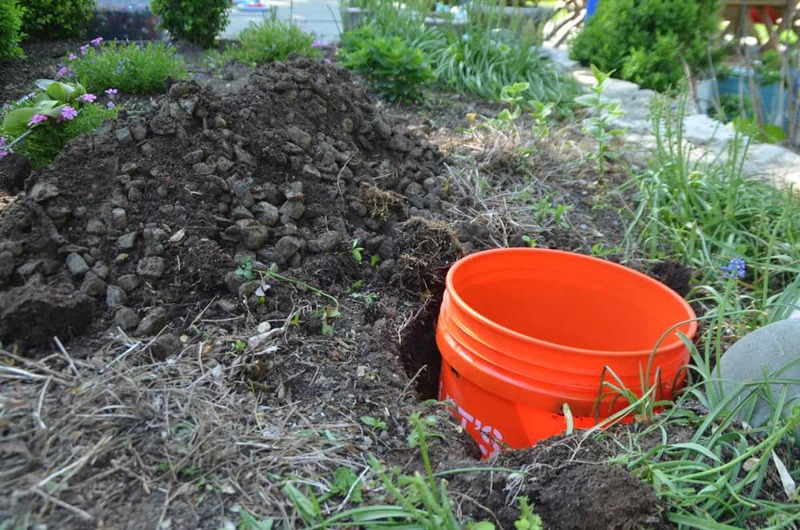 Anything would work… just snip some grooves in the edge of your bucket and lay the braces across the opening. I also snipped a groove for the pump cord to fit into. 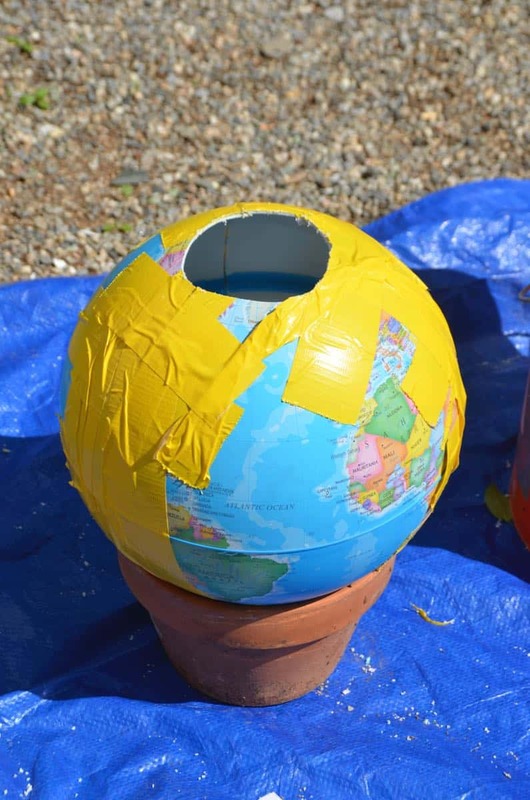 I took a little yanking and grunting and cutting, but the globe scheme worked and I was left with one equatorially marked orb. 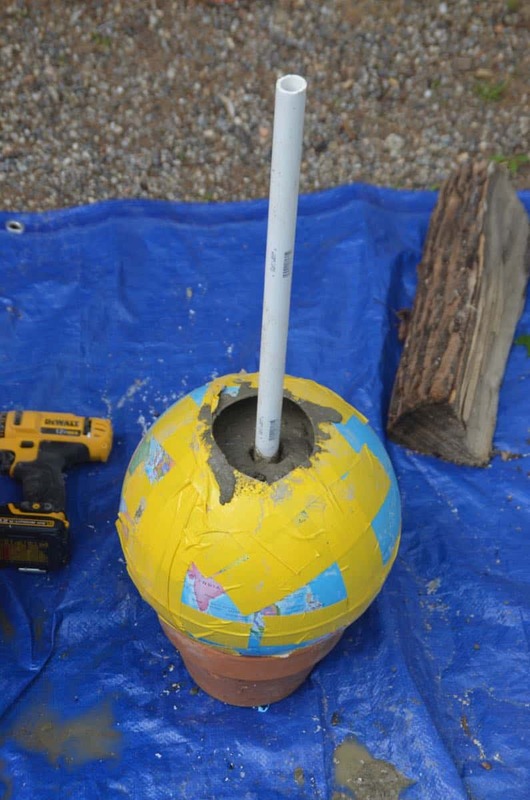 I cut away the duct tape from the PVC pipe and was left with a giant concrete lollypop of sorts. Here’s where the fountain assembly begins. 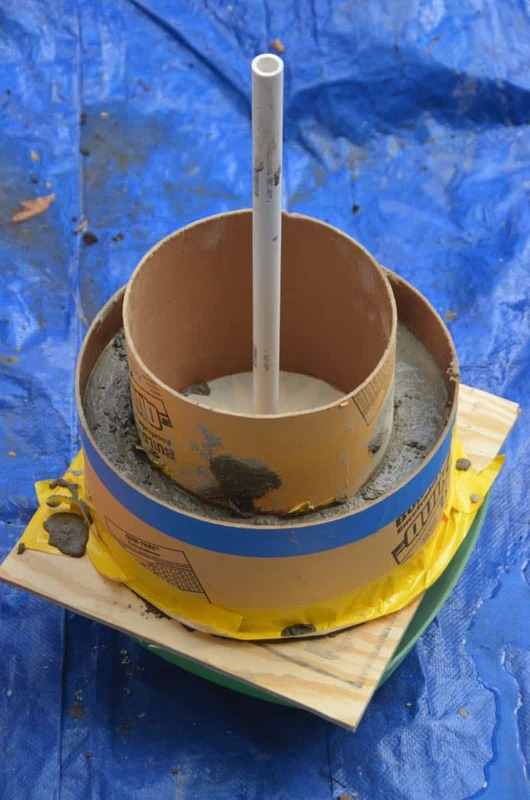 The ‘stem’ of this lollypop is actually the portion of the fountain that will go through the concrete base and into the bucket. Measure and cut the PVC so that it’s the right distance to the pump (I used a hacksaw, but it’s not very hard to cut…). This is where a 2nd set of hands would be helpful but it’s possible to do it solo if you’re in a pinch. 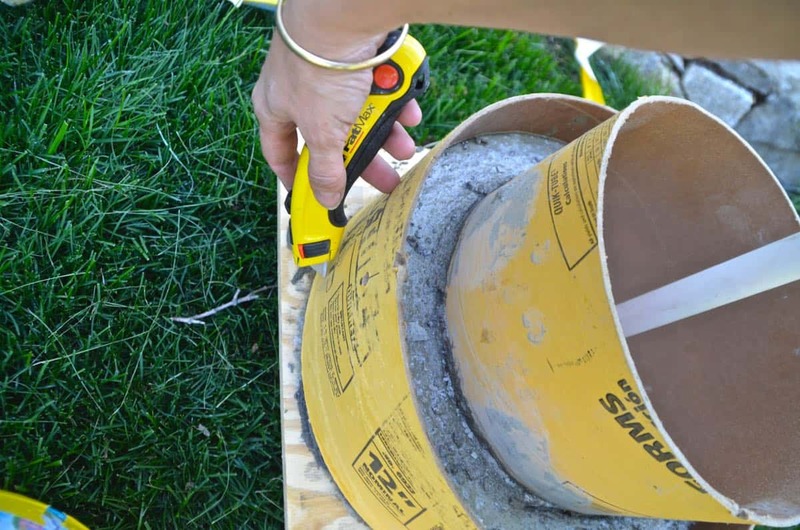 Attach your vinyl tubing to the pump and thread it up through your concrete base and then up through the PVC pipe (so through the base and through the ‘lollypop’ stem). DO NOT trim your tubing yet. 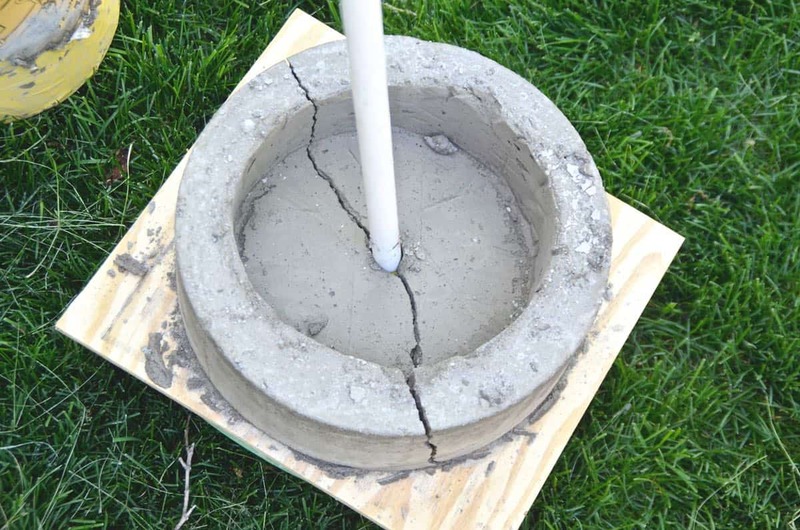 Carefully stick the PVC pipe through the hole in the base and gently lower it into your bucket until the orb is resting on the concrete base. Pull the tubing so there’s not any slack (gently so as not to pull it loose from the fountain pump). Test the fountain before you trim the tubing as once it’s cut, it will be much more complicated to fit the fountain pieces together again. Trim the tubing so that it’s just as long as the top of your orb. Phew… sorry to be so talk, talk, talk, but I wanted to make sure you had the full tutorial. I saw TONS of fountain tutorials that kinda-sorta explained how it all came together and I found it frustrating not to see the step by steps. Update: A larger submersable pump will allow you a different style of water feature if you prefer something that will spray the water a little higher. Wouldn’t it be easier just to use one of those PLASTIC balls for kids you can get at a dollar store, supermarket Or target? I hopped over to find your Twitter handle for the fair tomorrow, and this project stopped me dead in my tracks. You. Are. Brilliant! I’d love for you to post it on Hometalk! 🙂 Can’t wait to meet you! Thank you.. . 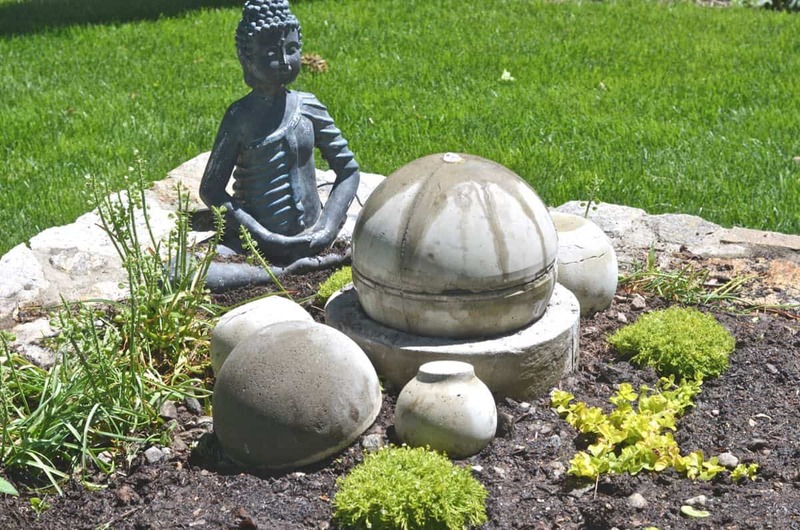 It nice to see a creative way to add to your garden and how to make the stuff! You’re so welcome! I’d love to make another next spring! love the fountain!! How do you replenish the water? Do you have to lift the fountain. (Globe)? Thanks! And I just let the hose run and the water drains down through the base, back into the reservoir. 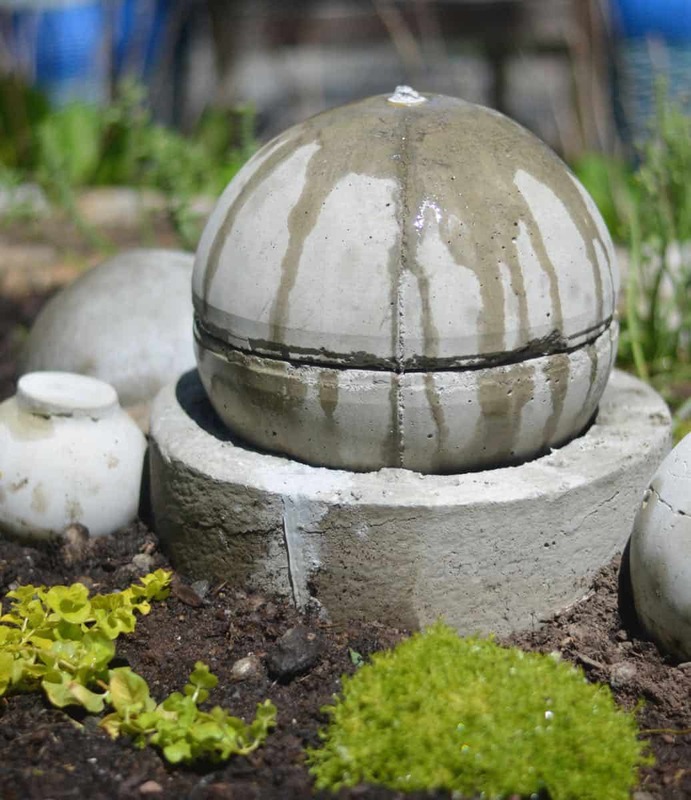 I was searching for DIY fountain ideas and came across this- I love the idea of a sphere! 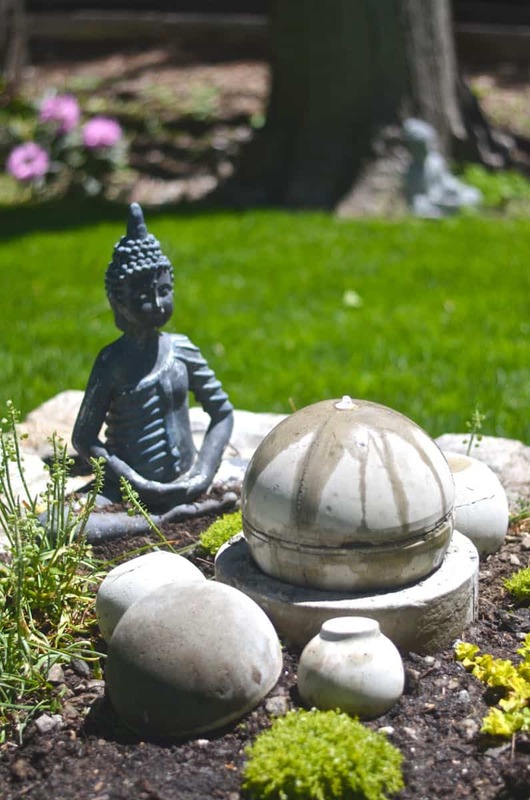 I can’t wait to try something similar, but I think I’ll use a plant saucer for the base. Thanks for sharing! I’m not sure who would love this more; my kids or my dog! What a great poject! Ha! I’m itching to recreate it in our current yard and yes… mine do the same thing. Kids and dog!